Once in a while it’s good to do something a bit different. Doing innovation means that doing something a bit different should be the norm. This keeps us on our toes and ensures that life at Birmingham Science City is never boring. Indeed. My latest challenge was to improve my understanding of science and technology innovation by decoupling science and tech from innovation for one day. 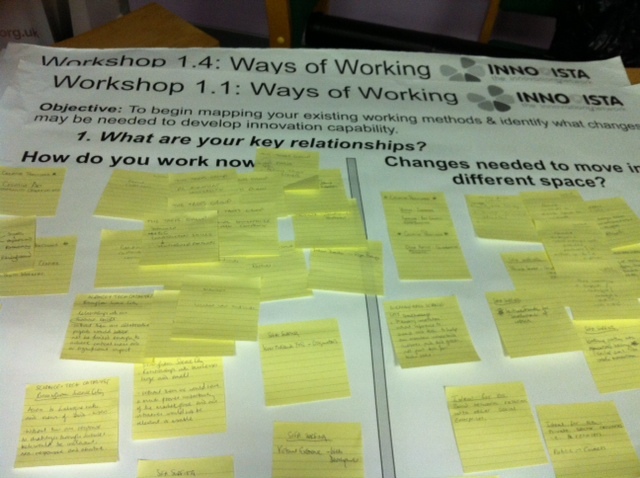 We were recently invited to a conference on ‘Open Innovation and Social Enterprise’ by Social Enterprise West Midlands( http://www.socialenterprisewm.org.uk), who were partnered by The Institute of Applied Entrepreneurship(http://wwwm.coventry.ac.uk/researchnet/enterprise/Pages/Home.aspx ) , Coventry University Enterprises (http://wwwm.coventry.ac.uk/business/Pages/CUELtd.aspx) , Innovista (http://innovista-network.co.uk) and Development Keys (http://developmentkeys.org.uk). The order of the day promised us a bit of technology and also a bit of innovation without reference to technology. I was happy to accept. In much of our work the triumvirate of science, technology and innovation is implicit. How would our hosts tackle innovation without the other two, I wondered. Of course, we are not so closed-minded as to suggest that innovation is the preserve of science and technology- the last two are a medium of and for the first- but I wanted to see how much non-technological innovation ideas and practice could help bring fresh new perspectives to what we are looking closely at, every day, as Birmingham Science City. Also, as some of you will know, I have a number of passions in life- there’s the science and tech side and the regeneration side. Not often do they mix, so when they do I can’t help but turn up. Arriving on the scene, it was great to see Bethan Bishop, Head of Research and Innovation, at Heart of England NHS Foundation Trust (HoEFT) ( http://www.heartofengland.nhs.uk). Bethan gave a powerful presentation on innovation for health. What was exciting was not the level of technology and design in health, but the importance that her Trust attach to staff and patient involvement in the innovation process. Innovation, she said, ‘was not just about gizmos’ but about the fundamentals of knowledge exchange. Scientists and technologists have certain types of knowledge, but this needs to be guided by those who encounter health challenges every day. Also, we talked about the speed and complexity of innovation. It doesn’t have to be this way. In short, most innovation can actually be time consuming, as we must define the nature of a problem properly before we plump for solutions. Problems are not always obvious- they need to be probed. Too often we skip this bit and concentrate too much on the solution, ending up with an inadequate answer. The complexity issue is not exactly a misnomer, because sometimes a good deal of detailed expertise is necessary, but then simple solutions should be explored before we scale-up. 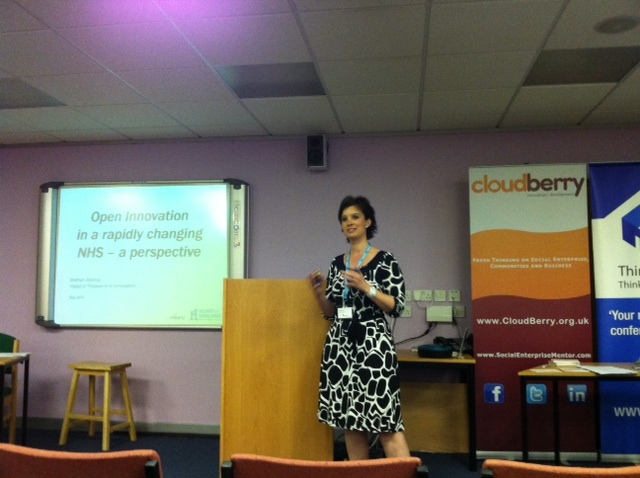 Bethan speaking about the rapidly changing health innovation landscape. -It’s good to venture out of your professional expertise zone once in a while to find answers to your challenge in other disciplines . I probably learned most from Mark Peters, a former footballer turned entrepreneur who has been turning his sports coaching and business skills and knowledge to helping young people through sport, health and motivational activities (check out http://www.start-again.co.uk/?page_id=2). I’ve never see anyone so convincingly apply concepts from a textbook and turn them into something so transformative in practical terms. Clearly, theory and practice needn’t be at odds. –Where innovation requires us to do something new, collaboration is key. Having people from so many different backgrounds in one room at first made me wonder if there was actually very little in common and that any talk of innovation would be superficial. But the day brought profoundly useful insights. If we got these from sports people, caters and community activists and what we discussed makes serious sense to all parties regardless of sector, our message is must be this: take the plunge with businesses, sectors and organisations that you don’t know. As long as you’ve all got commitment to solving a common issue and understand one another’s similarities and differences in knowledge and skills, you probably won’t go far wrong. We were very busy- eight A1 sheets covered with challenges and solutions, in half an hour- that’s with six sectors and a lot in common! Keep innovating and keep collaborating!